The first Mosaic the City project was in partnership with Market Square, Out of Hand Gallery, Lulu-lemon and Shylene.com. This summer long project, invited the community to design around the themes " Use what you have & what does Victoria Mean to you?" About one hundred hand drawn designs were submitted to the project with aprox 30% were then used in the five mosaics that are now permanently mounted in the square. Be sure to Visit Historic Market Square next time your downtown Victoria. 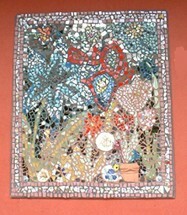 Look for all five mixed-media mosaics. This was the second project for MtC, in partnership with School district 61, Grace Lutheran Church, Local 730 of the International Association of Firefighters, and Artisan Tile. 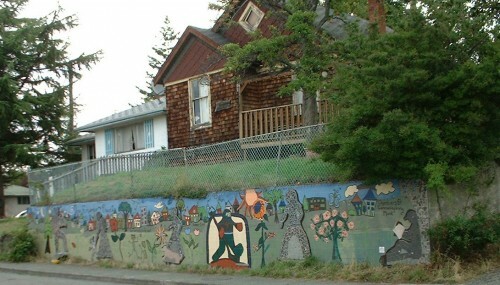 This 12-week project invited the people of Fernwood to think about "What community means to you." Within this theme the group found a way to mix the history of the area with the current landscape to create an amazing twelve-foot mosaic which is now ground laid in the Fort Street entrance of the School. Over one hundred people worked on the mosaic and more then thirty businesses and organization lent their support to the project. Another great success for Mosaic the City. On August 28th at Fernfest, Mosaic the City enjoyed theri first Community Unity March. Together with over 30 people The Flying Accuasations pipered the crowd to the mosaic mural on the 2400block of Chambers Street. The third project for MtC led by Shylene, a resident of Fernwood for the last six years, and in partnerships with the Fernwood Community Centre, the Fernwood Community Association and the Cox family. 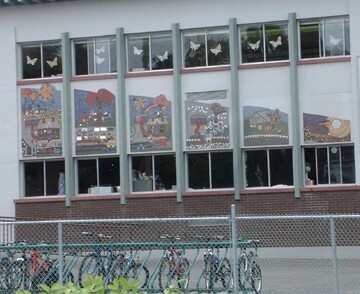 This quick summer project created a number of mosaics placed in various spaces around Fernwood.. how many can you find????? As the first phase of Mosaic Fernwood we are working to create not only community designed & built mosaics, but also lasting community spirit.